New from All Things Bunnies! 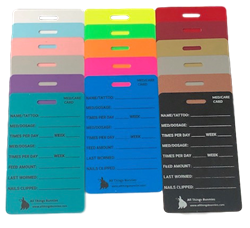 Our cage cards are made from durable 30mil PVC plastic and come in 15 colors. Size: 3 5/8" x 2 1/4". Keep track of medications, feed, and nail care for your small animal.